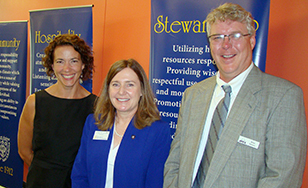 Duluth Mayor Emily Larson, St. Scholastica President Colette Geary, and Brian Hanson, president and CEO of APEX. President Colette Geary hosted Duluth-area business leaders on Aug. 24 in the College's new Health Science Center at BlueStone, 940 Woodland Ave. in Duluth. She was the keynote speaker at a gathering of the Area Partnership for Economic Expansion (APEX), an economic development group. "We are very proud of this facility," she told the audience. "It has added 45,000 square feet of instructional and laboratory space for health care education." The Health Science Center, which opened last month, is home to St. Scholastica's expanded graduate health science center programs in Physical Therapy and Occupational Therapy. Plans call for a new Physician Assistant program to open in fall 2017 pending final accreditation. The building also houses the maurices Community Clinic, in which students under the guidance of faculty provide treatment to members of the community who are underinsured or uninsured. Dr. Geary emphasized that St. Scholastica and the members of APEX have "important things in common," including a capacity to work together to ensure the economic well-being of the region. "I am committed to looking at new ways to enhance the College's synergy within the business community in the years ahead," she said. "I believe that partnerships are one of the most effective and efficient ways to promote creativity and to address complex social challenges." Audience members toured the $17 million facility after Dr. Geary's talk. "The College of St. Scholastica's Health Science Center is truly first-class," said Brian Hanson, president and CEO of APEX. "The College continues to invest in our region by providing students the opportunity to learn in such a sophisticated and modern environment." Dr. Geary was introduced at the event by Bruce Stender, who was president of The College of St. Scholastica from 1975 to 1981 and was a founder and former chairman of APEX.